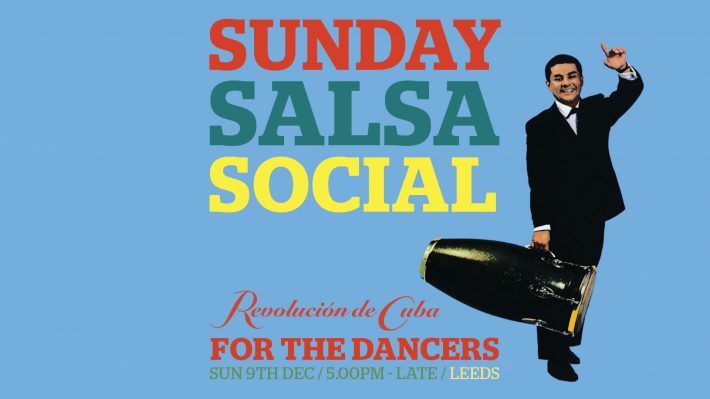 The final “Sunday Salsa Social” of 2018 at Revolucion De Cuba Leeds is on Sunday 9th December and it’s a special one. Not only is it the final one of 2018 but also our Christmas Party. Also, due to the weekly “Salsa Social” being cancelled on Tuesday 4th December due to Christmas party bookings, we’ve asked international salsa dance teacher Gormack Dione to come along to this “Sunday Salsa Social” and teach 2 salsa dance classes for us, improvers and intermediates salsa. Based in Manchester now though originally from Paris, he has taught salsa dance classes for over 20 years now in France, Spain and the UK and been a guest at numerous international salsa congresses (just confirmed for Berlin Salsa Congress 2019 and Ibiza Dance Festival 2019). In recent times, he has guested as teacher in Leeds at the last weekly “Salsa Social” and has also taught at Calle Ocho and DJ Lubi’s “Manteca” vinyl salsa party. A very good teacher who pushed students to achieve their full potential as dancers. Classes will start at 5pm in the club – improver/intermediate level – class 1 footwork/technique, class 2 partnerwork. Class prices are the same deal as Tuesdays at £4 for one class but just £7 for 2 classes as a special Christmas treat. Entry to the social is £3 as usual. The Sunday salsa social then kicks off at 7pm to midnight with your favourite Calle Ocho DJs Lubi & Fabio Bahia playing the best classic and new salsa, mambo, son Cubano plus a touch of cha cha cha and bachata. Five whole hours of dancing for all those who can’t make it to our weekly Tuesday nights due to school night/work the next day and also for all those who want to dance in our great first floor club for more then the 2.5 hours on Tuesdays. The small cover door charge is because “Sunday Salsa Social” is totally self-funded and the door take covers the box office person, the 2 DJs and the promotional costs. Unlike Tuesdays, which is funded by the venue from bar spend. The door charge also means we can stick to a harder and heavier salsa music policy and not have to compromise with more commercial sounds, as is the case on a free entry salsa night.